Expat Questions: What do I need to know about having a baby in the Netherlands? The author, 8 months pregnant. Picture taken along the North Sea in the beachside town of Scheveningen. 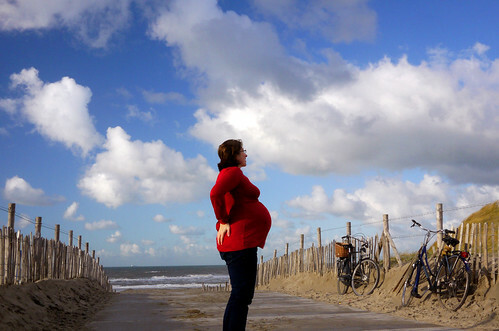 Here are useful tips and resources for Dutch expats who are pregnant during their stay in the Netherlands. They’re all things we learned while preparing for the birth of our two children. First, some reassuring words: Perhaps you haven’t been here that long, and maybe you don’t speak much Dutch. At times, the system may seem completely baffling but don’t worry too much. The care for pregnant mums is very good. 1. You’re Pregnant. Now What? Make an appointment with a midwife (verloskundige). You don’t need to go to the doctor, unless there are medical complications. In the Netherlands, the midwife takes care of nearly everything associated with normal pregnancies. You have free choice over which midwife’s practice you go to. Some are large (and you never see the same midwife twice). Others are tiny. They all have their own quirks, which may or may not be to your liking. TIP: Ask friends for recommendations and don’t be shy about changing midwives if you aren’t happy. Getting a new midwife is really easy. Just make an appointment at another practice and the new midwife will have all your files transferred. It’s really important that you’re happy with your midwife because she’ll be taking care of you during the birth. An early ultrasound image of a fetus around 12 weeks old. 10 weeks – This will determine the estimated due date. 12-13 weeks – An optional ultrasound that can determine your risk factor for genetic diseases such as Down’s Syndrome. This is usually paid out of your own pocket (unless you’re over 36 years old), and costs about €150. Towards the end of your third month, you might want to look into exercise classes such as pregnancy yoga and swimming for mums-to-be. Choose a kraamzorg agency. Kraamzorg is one of the best things about giving birth in the Netherlands. It’s a postnatal service that helps women directly after the baby’s birth. A nurse will come to your home and check to make sure that both mother and baby are okay. She can help with care of the baby (showing you how to breastfeed or bathe it, for example) and do some basic medical checks on the mother. Because of Kraamzorg, hospitals can release mothers from the hospital just a few hours after giving birth.You should choose a Kraamzorg agency by week 16 of your pregnancy. In some cases, your midwife may offer to register you with an agency that they are linked to. You can also choose your own. TIP: Make sure that you receive a letter of confirmation from the Kraamzorg. After filling out the forms with the midwife, we assumed that we were registered. Actually, our paperwork was lost and we had to re-register around 30 weeks into the pregnancy. That was a problem because by then many agencies were full for the time around our planned due date. Enjoy the 20 week ultrasound! It checks the developing baby in detail to make sure everything is going to plan. This is a really exciting ultrasound because you can see so much of your little angel. 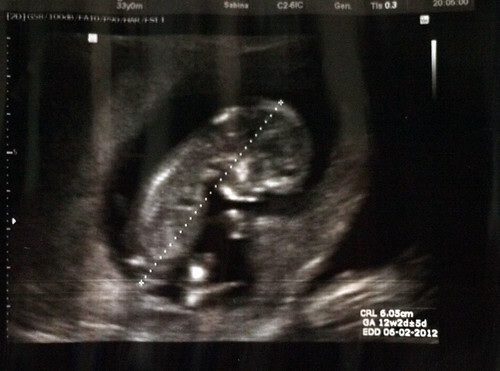 You can also ask about gender at this ultrasound. It’s worth your partner taking the day off work, so he can experience it with you. If the worst happens and there are serious problems with the baby, you have a few weeks to decide whether or not to terminate within legal time limits. Register for prenatal classes. You probably won’t attend one until you’re about 30 weeks but the English-speaking classes fill up quickly. Consider classes by ACCESS (The Hague , Rotterdam and Amsterdam), Birth in Holland – Confident Birth (The Hague, Delft and Rotterdam) and Mindful Birth (one-day workshop in Oegstgeest, near Leiden). Think about how and where you’d like to give birth. You can do this at home, as 1/3 of Dutch women do, or at a hospital. If there are several hospitals in your area, you can choose which one you go to. You don’t have to go to the closest one. Just make sure your midwife is happy to attend the birth at the hospital of your choice. Some hospitals have special birth clinics (such as the Geboortekliniek in The Hague) which offer a more private experience. Research your health insurance. Make sure you know exactly what is and isn’t covered, so you don’t get a large, unexpected bill afterwards! This can be a challenge to do over the phone (depending on how much English the people at the call center speak) so see if your insurer has a local office that you can visit in person. We’ve had an excellent experience with Azivo and if you live in The Hague (where the company was founded) they will give you an extra discount through their Wijkzorg package. Around 6 months, you can ask your insurer if you are entitled to a kraampakket. This is a box that contains everything you need for the birth and it’s usually given away free, if you’ve upgraded to anything more than the most basic policy. By now, you’re probably feeling a bit heavier and will be slowing down a bit. You’ll have more frequent appointments with the midwife and, around 30 weeks, a brief ultrasound to check the baby’s growth. This is your last chance to do some shopping and get everything ready. You might also want to meet some other mums. The Bumps & Babies playgroup is a great place to do this. Around week 36, you’ll have an “intake appointment” with kraamzorg. They should arrange this with you by phone around week 30, so if you don’t get a call then you should call them to double check. At the appointment, the kraamzorg will ensure that you have everything needed for the days after the birth, and answer any questions you may have. You can also decide how many hours you’d like them to come for. This is totally up to you but most people like to have as many hours as their insurance will allow. As soon as you’ve given birth, the kraamzorg will come to your home to show you how to take care of your new little treasure. Some parents worry that having a stranger in their home for a few hours a day at such a personal time will seem intrusive but almost everyone loves their kraamzorg carer. You’ll really appreciate the extra help as well if there are complications such as with breastfeeding. If all is going well, it’s okay to send the kraamzorg carer home a little early and if you don’t like your carer you can ask for a new one. You will need to register the birth of the child (aangifte van de geboorte) and its name within 3 days at the town hall (gemeentehuis) in the place where the baby was born. This is not necessarily the nearest town hall to your home so double check if your baby wasn’t born at home or in a local hospital. The mother doesn’t have to do this. Normally it’s the father’s job. While you’re there, ask and pay for an international birth certificate. This will make it easier for you to register the baby at your own embassy and to get baby’s first passport. TIP: If you are not officially married according to Dutch law, the child will automatically receive the mother’s surname unless the father and mother have previously recognised the unborn child at the town hall. This is called the ‘erkennen van de ongeboren vrucht’ and should be done before the birth. And now, it’s time to relax and enjoy life with your new baby! Expat Questions: How Do I Enroll My Kids In Swimming Lessons? Expat Questions: Who can I call if I need a doctor at night, on weekends or during holidays?